Under the “open space” project, Lockheed will publish technical details of its satellite platforms. WASHINGTON — Under pressure from the Pentagon to bring fresh ideas to the table, military satellite manufacturers are trying to build closer connections with startups and entrepreneurs that are fueling the space economy. Lockheed Martin, the nation’s largest military contractor, rolled out a new initiative this week to attract “aspiring space technologists.” It has decided to publicly release the technical specifications of its satellite platforms in a bid to attract “companies aspiring to send innovative technologies to space,” the company announced on Thursday. The company has produced more than 800 satellites. 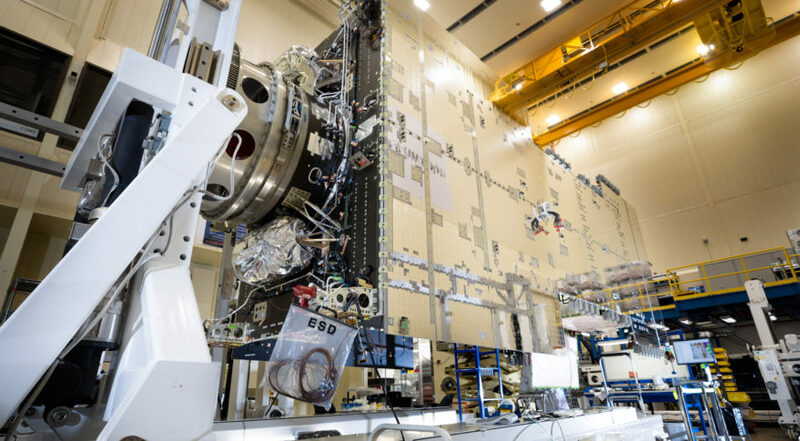 Under the “open space” project, Lockheed will publish technical details of the payload accommodation for its LM 2100 satellite platform, LM 400 small satellite and two variants of its new LM 50 nanosat series. The LM 2100 is the foundation for more than 40 satellites in orbit today, including weather, missile warning and commercial communications satellites. The LM 400 is a reconfigurable bus that can go to low-Earth and geosynchronous orbits. The LM 50 is a small satellite series that can host a remote sensing, communications and scientific payloads. The payload accommodation specifications were posted on the company’s website. Submissions are due May 11. Lockheed Martin invited startups, researchers and established companies to pitch technologies at a space industry conference in Silicon Valley on Wednesday. Lockheed’s bid to attract tech partners comes as the company faces competitive challenges in its military satellite business. The Pentagon intends to re-compete the manufacturing of GPS satellites that Lockheed has owned for a decade. The Defense Department in general is looking to shake up satellite programs amid growing concerns they have become too expensive and vulnerable to cyber attacks.